The mid-1800s were a time of intense conflict in the United States. Northerners believed passionately that a free country could not practice slavery. Southerners believed they had a right to decide for themselves what would happen in their states. Many Southerners wanted to secede from the United States. Northerners (and some Southerners) believed this would weaken both the North and the South. In 1818, Missouri asked to join the Union as a slave state. At this point, every state north of Delaware had made slavery illegal, while southern states still allowed slavery. Northerners did not want another slave state. The Missouri Compromise of 1820 allowed Missouri to become a slave state if Maine entered the Union as a free state, which maintained a balance between free and slave states. Lawmakers hoped this compromise would prevent a crisis; it only delayed it. In 1850, California was set to become a state. Northerners and Southerners argued over whether the state would be a free state or a slave state. Speaker of the House, Henry Clay argued that if California entered the Union as a free state, then the people living in other territories, such as New Mexico and Utah should be allowed to vote on the issue for their own states. Daniel Webster gave a rousing speech for the compromise and it was approved. Like the Missouri Compromise, the Compromise of 1850 only delayed conflict. The Fugitive Slave Act of 1795 required escaped slaves to be returned to their masters. Most people in the North ignored this law; The Compromise of 1850 strengthened it. Slave owners could go after escaped slaves; anyone caught helping the slaves faced punishment. In October, 1869, abolitionist John Brown led a raid on an arsenal in West Virginia. He hoped to arm slaves with weapons and start a slave rebellion. Brown and his men were stopped by Colonel Robert E. Lee. They were later hung for their crimes. Senator Stephen A. Douglas suggested that the citizens in the Kansas and Nebraska territories should vote to decide whether their states would allow slavery. People who believed in slavery moved to these territories temporarily so they could vote “yes” for slavery. Free-soilers, people who believed the new territories should not allow slavery, were very angry. In 1856, fights broke out in Kansas. Over 200 people were killed. In 1857, a slave named Dred Scott sued the Supreme Court for his freedom. Scott’s owners had moved from the South to the North, bringing him with them. Dred Scott argued that since he was now living in a Northern state where slavery was illegal, he should be free. The Supreme Court declared that slaves were personal property to be taken with their owners anywhere. Southerners could now legally take slaves into free states. Visit Scholastic to see a map of Union and Confederate states. Declan, Tobin. " Civil War Facts - The Causes ." American History for Kids, Apr 2019. Web. 21 Apr 2019. 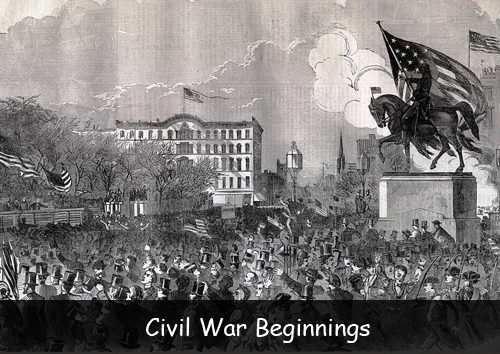 < https://www.americanhistoryforkids.com/civil-war-beginnings/ >.